I'm truly thankful for everyone's positive approach to our little sewing community (which is growing by the way - did you see?). It really is making my quiet moments of motherhood (you know the ones I mean) so bright. So thank you! 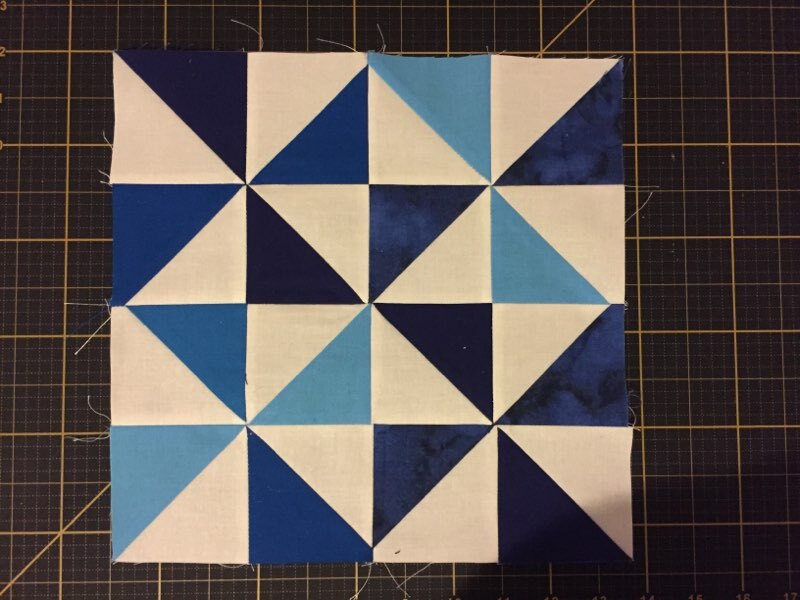 Last week, Colleen walked us through a beautiful Windmill Star block. Yours were stunning! It's starting to take shape. We also discussed doubling up on some weeks; as some of you are eager to produce more. Keep going at your own pace. 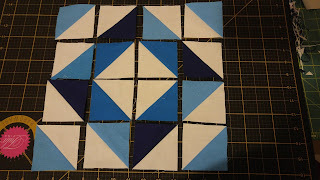 there will be a lull at the end as we piece our blocks together and prepare to quilt. If you miss a week or two, you will be able to catch up. If you're new to the Sew-A-Long, welcome! Have a read through Week 1 and Week 2 for some fundamentals and start with this week's block. This week is sponsored by Fabric Crush. Fabric Crush is owned by local company, Sewing a Rae of Sunshine is dedicated to fostering an inviting community for sewists to learn. You can find their classes at www.fabriccrush.ca. Jenna-Rae has kindly put together the cutest prize pack: this custom pin cushion and needle minder. 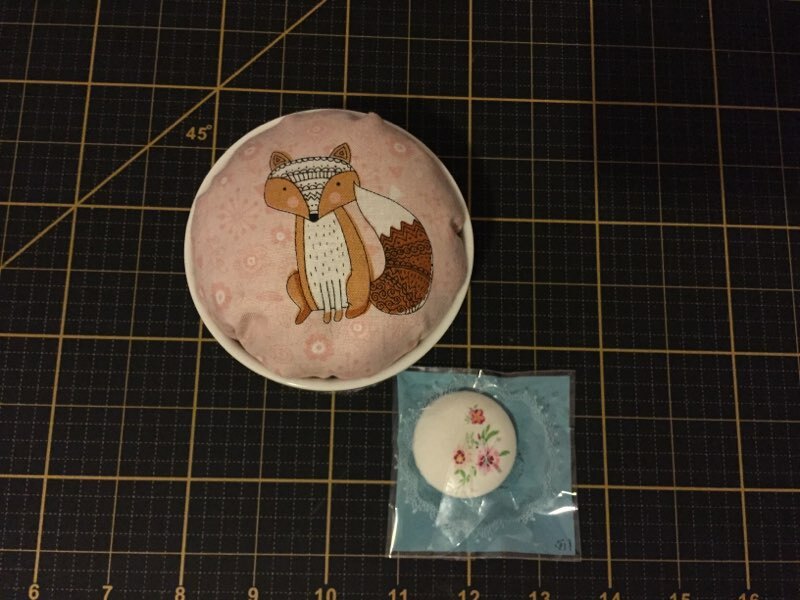 The pin cushion is too cute for words and can be used at the side of your sewing machine. It contains walnuts and they sharpen your pins with each use. The needle minder can be attached to any metal piece of your sewing machine to hold your needle if you need to swap out. I also use mine while embroidering. I've even worn mine as a pinless motif on a shawl. It's a wonderful tool. 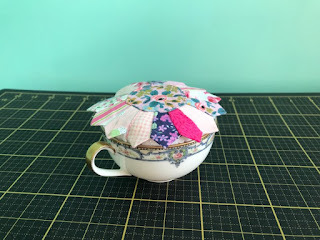 In order to win this prize, you just need to post a photo of your finished block, in Sew Ottawa!, before the Week 5 Blog post. Thank you Fabric Crush! This week, I have two blocks for you. The first block is the Dutchman's Puzzle (can I say that here?!). I love this faux Flying Geese look. It is a very versatile configuration. Dare I say, it could look even modern with the right fabric selection? I've chosen 4 coordinating colours to contrast against the Kona Snow (main). The sky is the limit in terms of fabric selection. 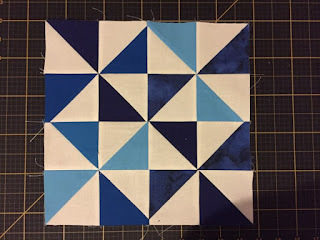 Check out Week 1 and Week 2 for the basics in constructing a HST block. I chose a (flying?) Pinwheel for our second block this week. My understanding (and please correct me if I'm wrong), is that a regular pin wheel has the same colour for all 4 "blades" of the pinwheel. A flying or moving pinwheel uses multiple colours to give the illusion that the pinwheel is moving. I think we have all grasped the concept on how to put HST blocks together. Now let's talk about tips to give you accurate blocks. Pressing and squaring up are Key. In this block, you'll learn how to manage seams with multiple biases. This is where pressing is going to make or break your block. I don't know about you, but mom life and buffet lines have taught me to source stretchy, wrinkle-free clothing. I rarely iron anything; let alone PRESS fabrics. So let's talk about it. But seriously, there is a difference between ironing (swishing the iron around the fabric until it looks flat) and pressing (placing the iron onto the fabric and pushing down). Here is how I was taught. I would love your suggestions and descriptions in comments as I'm sure we could all learn from you. First, you need to know your fabric. For Quilting cotton, I set my dud of an iron to 4, without steam while piecing. I was taught not to use steam, while piecing as it can distort the fabric at this stage and could make your quilt top lumpy. I'm normally a press to the dark side kind of gal. If you are too, give it a try with this block. You might find that the seams start to get pretty bulky. To help with this, I pressed many of the seams open. This means at the seam, half of the fabric goes to the left, and half to the right. * If you press your seams open - this means you will not be able to stitch in the ditch when quilting. We can talk about that later. Let's continue on. Well that was easy. Now, what about adding two rows together? Line them up and see how they feel. Pretty thick right? Go ahead and sew them together (make sure to use pins!). Now, I like to finger press the seams open to coax everything in the right direction. I place my iron on top, press and hold -- like you would if you dumped a glass of red on your sofa. Don't swish! 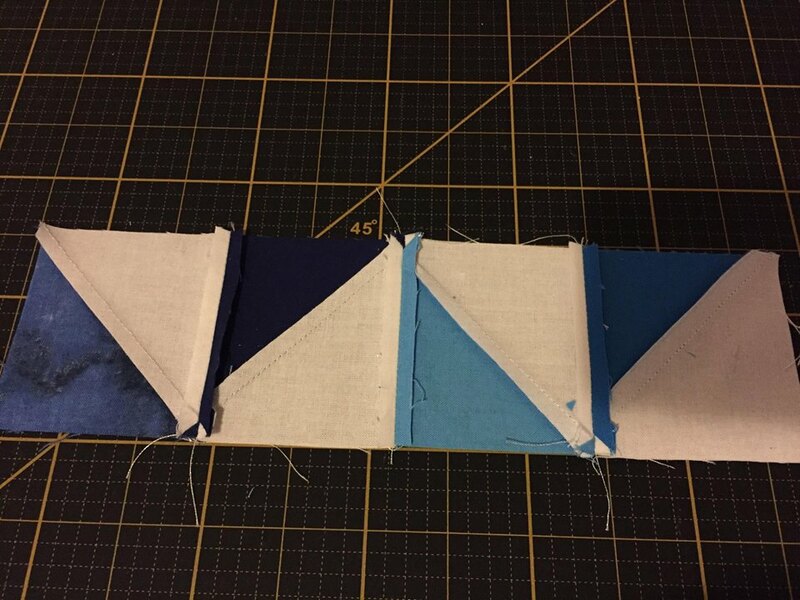 Your seams will end up all over the place and you could risk distorting your block and stressing your seams. Place, press and lift. Move to the next section: place, press and lift. you might need to do this several times. Flip the block over. Do the seams seem flat? If there is a bubble in your fabric, coax it flat. Be assertive, but don't pull/manipulate the block hard enough to distort/distress the fabric or seams. Continue with the remaining rows until you have your final block! I can't wait to see your blocks and look forward to hearing your feedback and thoughts! 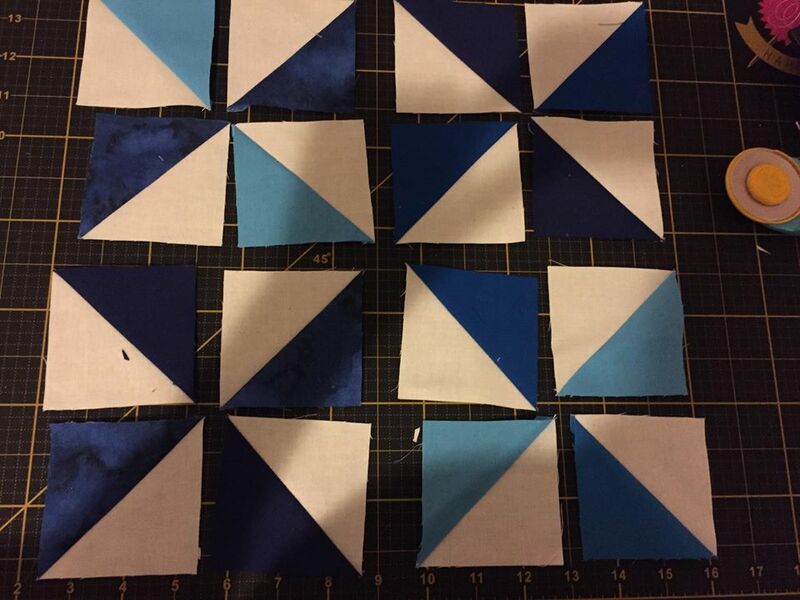 Check back in next week with Colleen at Sewing for Sawyer for Week 5!. 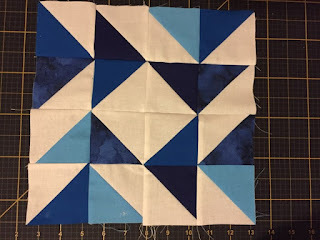 So - Quilting cotton - in my experience is pretty tough stuff. Don't blaze your iron, but don't be afraid to pause and press on the wrong side. Now, when you flip it over to the right side... most quilting cottons are ok to apply the same technique. I recently worked with a heavily printed fabric. the ink on the right side was "thicker" and metallic. It could only handle low heat and absolutely no swishing. You'll know! Linen: Sometimes we like to quilt with linen. It's excellent, but has its own quirks. Not all linen is created equal. Quilt shop linen should be fine. But test yours out first. for example, when I sew garments with linen, I ONLY press from the wrong side so I don't get shiny iron marks at the seams (it's not a cute look). It was March Break for many of us this week and I know it was hard to get to the sewing machine. Many of us were travelling, or were quarantined with the great flu of 2018. Kudos to everyone who completed blocks or chimed in to encourage each other. We made it through. You should now have 13 blocks in your Work-In-Progress (WIP) bin. If you're just joining us, you have 13 templates for block options. We set out to complete 16 different blocks. Today we will go through the last 3 blocks of the Sew-A-Long. We will also talk about optional sashing. I know, I know... this is a lot to discuss. Continue along at your own pace. There is lots to discuss coming up and so you will have time to catch up later if you complete less this week. Let's Do a Sew-A-Long I am so lucky to be surrounded by many enthusiastic makers, both online and local to me. We have daily cheeky chats and sometimes we talk about sewing (or stash collecting haha). This community has made this whole process so enjoyable for me. 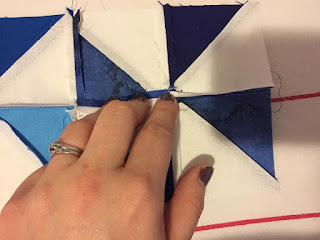 A couple of weeks ago, I received a little message from my friend, Colleen Fifield of Sewing for Sawyer, asking my opinion on starting up a little online, local, general, sewing group. This has been something I had been hoping for, so of course I was all for it. "Sew Ottawa!" was created. The group has been an incredibly positive space, full of creativity and enthusiasm. Many members have had an interest in quilting. 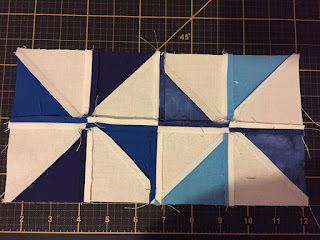 A few days after the launch of our group, Colleen reached out suggesting we do a Sew-A-Long on the basics of the Half Square Triangle Quilt. Welcome to Week 6! You have some serious quilt real estate happening now. 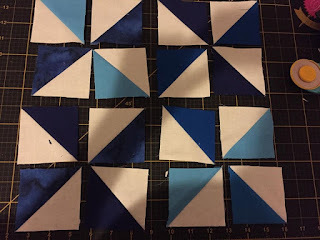 You might feel equally excited because things are looking "quilty" and overwhelmed because there has been so much work and still no snuggly blanket! Keep at it, we'll soon get to talking about putting the top together and the whole quilting process. Last week, Colleen generously offered up a Frixion Pen and Colour Catchers! I use these in my in sewing room often. I use Colour Catchers with each wash of new fabrics. 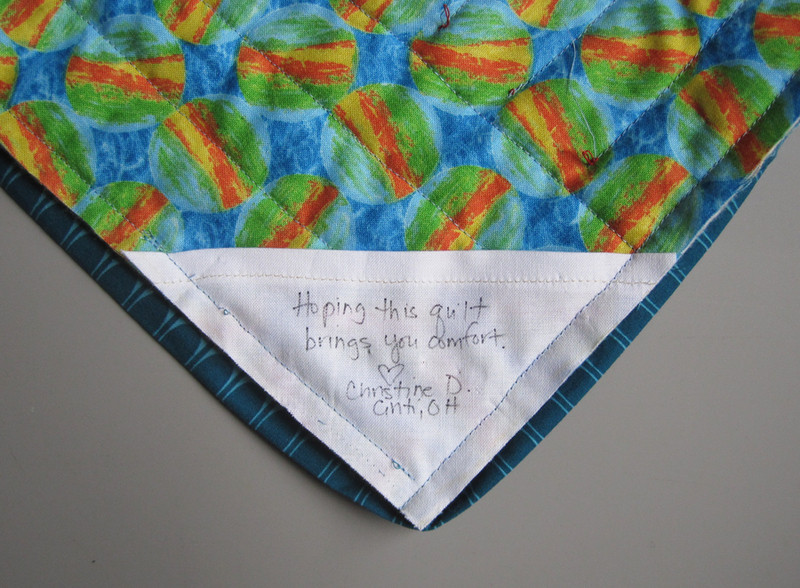 I also gift one sheet with every quilt I gift with a little note.